Q. How do I find out if the library has a particular book? You can use the Library Catalogue to check if we have a book in stock. The best way to search is to enter the author's surname and a word from the title of the book in the Search Box. If the library does have the book, the catalogue will show which library the book is held in and where on the shelves you will find it. This is indicated by the shelfmark. If all the copies of a book you want are on loan or not available at your own campus library you can use the reservation system to reserve a copy of the book. The catalogue will also show if there if there is an e-book edition of the book available and provide a link to the book. 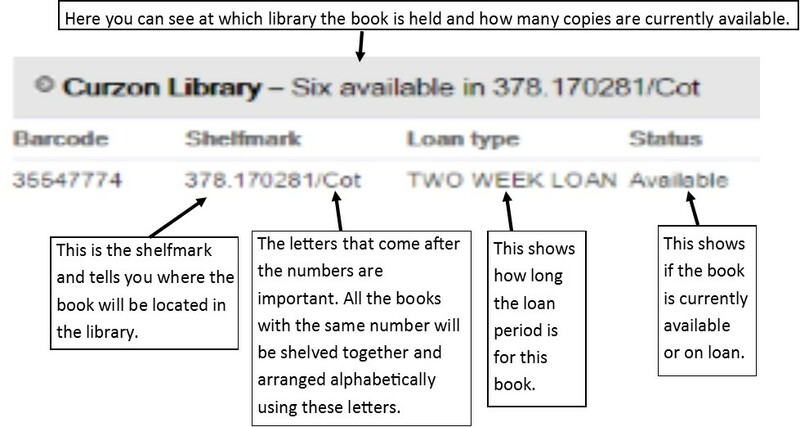 If the library doesn't have a particular book you need for your studies you can use the Inter-Library Loans Service to request to borrow a copy from another library.